(Ben Dorger | Standard-Examiner via AP) Justin Hansen, of host The PEZ Collection Podcast, sits for a portrait with part of his collection in Ogden, Utah, on Thursday, Jan. 31, 2019. It's a particularly fitting admonition given that the topic of the weekly show is PEZ dispensers, those handheld spring-loaded candy dispensers topped with the heads of cartoon characters and other cultural icons. 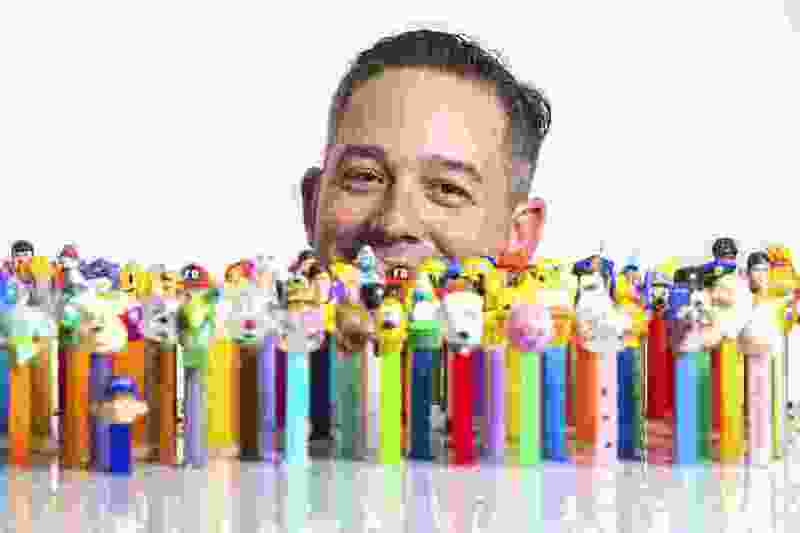 The Ogden man, who co-hosts "The PEZ Collection Podcast" with fellow collector Andrea Gage of Dos Palos, California, collects all things PEZ-related. He's got everything from vintage 1950s-era PEZ dispensers to the very latest styles. He's amassed boxes of the tiny brick-shaped candies that the dispensers eject. And he's collected all sorts of other memorabilia like shirts and pajamas and posters — anything you can think of with the PEZ name on it. "PEZ is so just much fun," Hansen admits. "Everybody's got a story from having PEZ when they were younger." Hansen's own story begins two decades ago in Slaterville, where he started collecting PEZ while a student at Fremont High School. It began with a few "Garfield" PEZ dispensers (you know, the cat who loves lasagna and hates Mondays), and it just grew from there. "I'm like anybody," Hansen said. "You'd pick up a few PEZ here and there, and think they were cool, but what do you do with it? So my real interest in PEZ sat dormant until I saw what it could become." Hansen finally caught a glimpse of his PEZ-collecting future two years ago, after seeing a set of eight or nine Garfield and Odie dispensers at the quirky Smith & Edwards warehouse store. He suddenly felt the urge to collect them all, and realized PEZ dispensers could make a pretty darn fine hobby. Today, Hansen — who by day is a window washer for Extreme Cleaning in Ogden — estimates he owns about 2,000 PEZ dispensers from all over the world, including Austria, Sweden, Hong Kong and the U.S. He admits his collection is small compared to some, and the problem with collectibles is that it's a never-ending process. "You can never really have them all," he said. That's because the makers of PEZ are constantly adding new dispensers — some in extremely limited runs. For example, in the 1960s PEZ came out with a Mary Poppins dispenser in honor of the Disney movie starring Julie Andrews. "They made a limited run of that one and distributed it, but it didn't really look like Mary Poppins and Disney told them to stop producing it," Hansen said. Today, that dispenser is quite rare and valuable. Other PEZ dispensers are even less common. For the royal wedding of Prince Harry and Meghan Markle, the company made PEZ dispensers in the couple's likenesses — but they only made one of each, and auctioned them off for Make-a-Wish, according to Hansen. "They got almost $10,000 for that, because there was only one available," he said. And sometimes, folks use 3-D printers to make their own PEZ dispensers. Hansen says it's not really pirating because the company actually promotes the idea. "My daughter even made a PEZ dispenser of my head — she made it out of clay, and it looks a lot like me," he said. Hansen's favorite out of his 2,000 PEZ "children"? Probably his rare psychedelic dispenser from the 1960s. It features a hand with an eyeball in the middle and reads "Luv PEZ" down the side of the dispenser. Currently, Hansen is in the process of creating a PEZ room in his house. His "enabler" fiancee, Emily Jones (The PEZ world is divided into two groups — collectors, and their loved ones, called enablers), gave the go-ahead to use part of the unfinished basement. "I put up drywall, so it's like my man cave," he said. "And it will eventually be a PEZ cave." According to the official PEZ website, the candy was created in 1927 by Eduard Haas III, of Austria. The peppermint bits were originally introduced in small tins, with the "PEZ" letters coming from "Pfferrerminz," the German word for peppermint. In 1949, the first PEZ mechanical dispenser was patented and introduced by inventor Oscar Uxa. "It was actually made for a non-smoking tool," Hansen explains. "But it didn't do well as an adult stop-smoking tool." So what did they do when PEZ failed to catch on as a smoking-cessation product for adults? And that's when the whimsical dispensers really took off. Unlike the hard sheets of pink bubble gum in a pack of collectible baseball cards, Hansen said a lot of collectors actually love the PEZ candies — although he isn't so big on the "chalky flavor." He used to feed the candy pellets to his kids, until they got sick of them. "Now, I keep the candy and hand them out — or do an art project with them," Hansen said. "I built a gingerbread house out of them once. "And one collector in Michigan makes beer out of the candy," he continued. "The sugar in the candies makes a good beer. I've never tried it myself, but a lot of people love it." Hansen and Gage started their weekly PEZ podcast last June — they've done about 30 episodes thus far. "I think Justin is a wonderful guy," Gage said. "It's amazing how quickly you can become friends over just a small thing like PEZ. With listeners in 10 countries, the two podcasters often have guests on to talk about their collections. "In the beginning of the podcast we started out with PEZ facts and things like that, but it's developed into a sort of 'People of PEZ' podcast," Hansen said. "We'll talk about upcoming conventions, and what they do there, but mostly it's about people and their history and their stories." Hansen and Gage first met in an online "Let's Talk PEZ" group after Hansen asked if there were any PEZ-centered podcasts floating around out there. There weren't any to speak of, and Gage, who was just learning how to produce podcasts, volunteered to work with Hansen on the project. He handles the booking of guests, she does the back-end production of the audio file. They record each show in a video conferencing program called Zoom, usually on a Sunday; the podcast is then available on Thursday. "Justin and I have never met in person," Gage says, "only online over Zoom. We hope to meet at a convention sometime — not this year, but maybe next year." Gage, too, began collecting PEZ dispensers in her youth, although she's been much more active in the last few years. "As my father says, he thinks I've kept everything I've ever been given as a child," she said. "And I think he's right." Gage said the question "How many dispensers do you have?" is usually the first thing people ask about PEZ collections. She confesses she stopped counting her own about 10 years ago — she had roughly 800 at the time. "It's probably closer to 1,500 dispensers now," she said. Gage's favorite dispenser? A yellow-and-purple pony. It's worth $800 to $1,500, but Gage says she'd never part with it. Her second favorite? A treasured Peter Pan dispenser she found last year at her first PEZ convention. But Gage says she found much more than a Peter Pan dispenser at that show. "I also found my tribe," she explains. "These people are the most loving and caring people there are. They're fun and goofy and all about giving." Like Hansen, Gage isn't a big fan of the candy, either. Still, she keeps it all. "I have four shoeboxes full of the candy," she said. "I'm somebody who we might have a little hoarding issue here. But that's always the question, isn't it? Hoarder or collector? You tell me. I consider myself a collector." Hansen, who is always more than happy to share his passion for PEZ with others, invites people to check out his website, www.thepezcollection.com, or contact him at info@thepezcollection.com.